A tundra landscape near the peak of the summer growing season. The Arctic tundra keeps an enormous amount of carbon in check in its soils, but as the region warms, that carbon could start leaking back into the atmosphere in a big way. A new study adds fuel to this concern by showing that at the longest-monitored site in the Arctic, our planet’s metabolism is speeding up. For the past four decades, researchers in the remote Alaskan town of Utqiaġvik (formerly Barrow) have been taking year-round measurements of carbon dioxide in the air to track the tundra’s seasonal cycle—the drawdown of CO2 by plants during the summer growing season, followed by an earthly exhale in the fall as vegetation is gobbled up by soil microbes. By carefully examining this carbon ledger, scientists have started to notice changes. The seasonal swings are getting bigger, for one. The tundra appears to be sucking down more carbon in the summer, and releasing more in the fall. This in itself isn’t shocking: As the climate becomes warmer, plants are expected to grow more vigorously. Soil microbes should also get a boost from fairer weather. But in Utqiaġvik, carbon is escaping into the air faster than plants are taking it out. Put another way, the bugs appear to be more temperature sensitive than the shrubs. And that’s causing carbon to cycle through the entire ecosystem faster: When the researchers plugged their data into models, they found carbon’s “mean residence time” in the tundra had decreased 13 percent in just 42 years. “This is a tremendously significant amount,” Charles Miller, a carbon cycle scientist at NASA’s Jet Propulsion Laboratory and co-author on the study published Wednesday in Science Advances, told Earther. 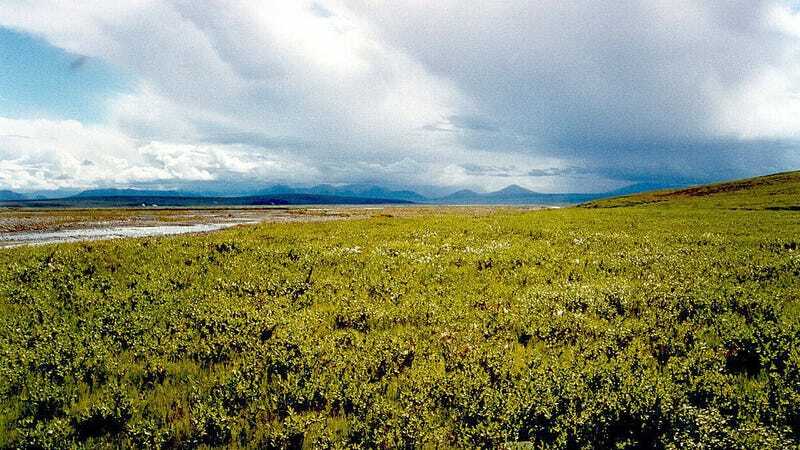 Miller said the carbon cycle speed-up reflects a “borealization” of the tundra—a transformation of an ecosystem where all biological processes are sluggish into something more akin to the boreal forests hundreds of miles south. If that finding holds true in other parts of the tundra, it’s a big deal. “If we are indeed shifting toward a faster carbon cycle, that is essentially saying we’re losing the capacity to hold onto that carbon in the ground in the Arctic,” Merritt Turetsky, an ecologist at the University of Guelph who wasn’t involved with the study, told Earther. How much Arctic carbon could be lost to the atmosphere as the Earth warms is still an open question. But only a fraction of the 1,300 billion to 1,600 billion tons of carbon locked away in permafrost soils needs to escape to have climate impacts. Turetsky noted that the new study didn’t pin down precise mechanisms driving the changes in Utqiaġvik, and that it only focused on CO2. Another big piece of the carbon puzzle up north is methane, a greenhouse gas up to 84 times as potent as CO2 that’s released from water-logged soils. If the Arctic becomes leakier with respect to methane, that could amplify warming even further. The biggest strength of the new study, in Turetsky’s view, is that it presents a simple tool—mean residence time—for detecting subtle but significant changes in the carbon cycle that are often hard to tease out from all the ecological noise. “It’s basically a clever way of thinking about a complicated problem,” she said.